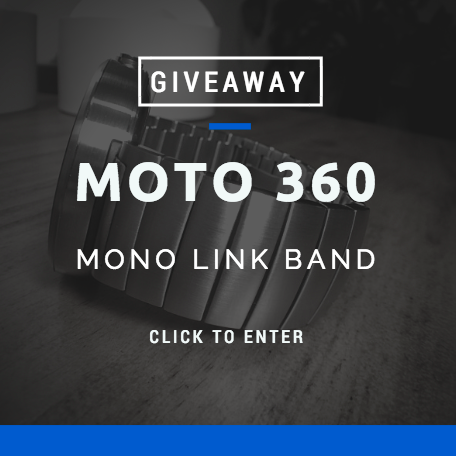 First look at the Mono Link Band for Moto 360 + Giveaway! Finally! The band we've all been waiting for. When the Moto 360 was first released, this is the one first shown off. For whatever reason Motorola decided to make us all wait some painful number of months before we could finally get our hands on it. In the meantime we found other compatible bands for the Moto 360 that you can still buy today. Also, don't miss our reviews of aftermarket Moto 360 bands! But the wait was definitely worth it because this band really does live up to the hype. You see the term "Mono link" actually means single pieces of metal spanning across the entire length of the band. In contrast, the original metal bands that were first released offer a more traditional rounded triple-link design. When taking it out the box the first thing you notice about the Mono Link band is how simple and elegant it is with a nice heavy feel to it. The metal has a nice brushed polished look and while it looks amazing right out of the box, we must warn you it does appear that it could be susceptible to smudges and scratches. While the band includes additional links, tools are required to resize the band (like most metal bands). Small things aside, overall this band makes the Moto 360 feel and look like a much more expensive piece of jewelry. We especially love way the metal links seamless flow starting from the top of the watch all the way down to the butterfly clasp. Speaking of the clasp, it brings up yet another great feature of this band — the way the clasp is completely hidden and integrated into the band. The Moto 360 with the Mono Link band fits perfectly over a dress shirt. With no bulky clasp at the bottom and a slight rounded edges on the band, you're now able to give your dress shirt cuffs a little bit more room to breathe. More importantly, when you need to be able to quickly check your smartwatch it's nice not having your watch get stuck. On many other bands the clasp can be a real hit or miss. Nothing worse than having a cheap clasp that feels light and flimsy for something you're using on a daily basis you should have something nice. This is where the Mono Link band really delivers, the hidden clasp not only looks good but it's sturdy and makes that real nice solid "Click" when you strap it on. Not Sold Separately? C'mon Motorola! Where's the Mono Link band in Black? Also, don't miss our list of aftermarket Moto 360 bands! Good news, we're doing a giveaway! Yes — we're crazy enough to give away our new prized possession, the best band available for the Moto 360! Why we do such a thing? What better way to entice you to come join our awesome new community. I love the brushed steel look of the band! Great choice, Motorola! Thanks for the picture on your arm, I haven't seen any prior on-wrist pics. The monolink looks awesome, would love this watch! Now that's awesome! The look really compliments the overall style of the 360. Looks great. It looks nice and chunky too. I tried the pebble band on my Moto 360 but it just felt so cheap This looks really smart! Man this looks amazing! Very futuristic. Looks great, was curious how it fits 'larger' wrists? Very very interesting band. Much nicer than my pebble steel band. This would be a great upgrade from the stock leather band. It's a beautiful band. I really hope they are made avaliable on their own. If they make a champagne version I'd be all over that.